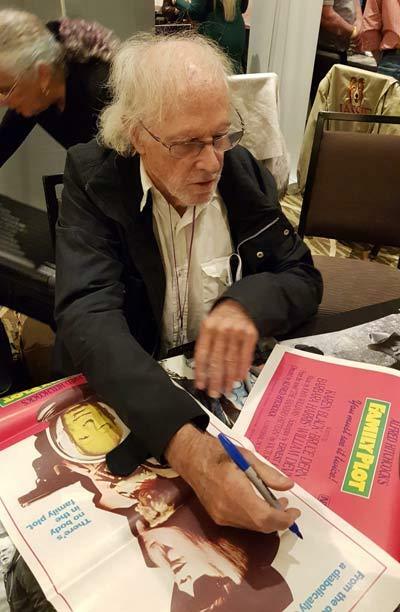 Bruce Dern signed some Australian daybills for us at the Hollywood Show which was held on 10th Feb 2018. Bruce has appeared in many films over the years including two Alfred Hitchcock movies, a small appearance in Marnie and a starring role in Family Plot (1976). Bruce MacLeish Dern (born June 4, 1936) is an American actor, often playing supporting villainous characters of unstable nature. He was nominated for the Academy Award for Best Supporting Actor for Coming Home (1978) and the Academy Award for Best Actor for Nebraska (2013). His other film appearances include The Cowboys (1972), Silent Running (1972), Black Sunday (1977), Monster (2003), and The Hateful Eight (2015).